Anthropologists have studied the Irish social systems for decades and in the 20th century it was Schepper Hughes who studies Irish rural life and there is also the study of family and community in Ireland by Aarensburg and Kimbal. But we must not forget the study of Aran island folklore by Synge in his journals even earlier and his publication in 1907 focussed upon the evidence of earlier pagan values in the lives of islanders and the earlier efforts of those who came and lived in Ireland for a period and wrote about their observations. The collapse of the so called Celtic tiger and a recessional period is a good opportunity to re-examine collective beliefs and to deconstruct past and contemporary claims about ancient sites on the landscape. What is left unsaid and the role of place in conjuring and preserving memory is the aim here. Inchegoill an island on Lough Corrib beside Ashford castle has a 5th century Christian site and outside of the church in a reilg or cemetery stands an even older Ogham stone with names of ancestors inscribed therein. The site has always been described as a Christian site and this tourist trail today continues to generate old ideas. Does nostalgia shape the collective memory of these sites? This is the ideal space for reassessment of old ideas and for discussion about what is unsaid and possibly for collective healing. Distance gives perspective and a different insight and it is what is not said that often reveals much more to us than what is said. The pre-Christian nature of this stone is vaguely mentioned in passing on the tourist trail and the unremembered aspects are of historical relevance. Archaeology unearths elements of the past and deals in facts and in reassessing the collective beliefs, and older political and religious ideas can be contested. The archives, storytelling, folklore and their role in remembering can be vital as supportive documentation for re-evaluation. Story and storytelling is vital in the study of community and people. This paper is a space for perhaps thinking outside the box. Collected and collective knowledge can be built upon to add new dimensions and a new wider perspective reflecting this era with new insights. This ancient Irish inscription can be read as a story, biography, and even a cryptic code and here are my thoughts and efforts at decoding that message. This is my interpretation of those words not on that day but I reflected upon them later and this is based upon much reading of Irish medieval texts and translations. What did strike me immediately was the name Suqe a name I had come across in vitae of Saint Patrick where he had four different titles while he served four different masters, Magus (meaning famous), Succetus (meaning god of war), Qatricus or Cothiriacus (meaning served 4 houses of druids) and Patricus (meaning father of citizens)! But this had not been noticed by others in their interpretations. As we know every individual brings their knowledge to bear on a reading. The entire list read like a genealogy and story of heroes and ancestors. To start with, lets look at the breakdown of those letters and remembering that the oldest written words were all joined together! Lie is the shortened version of stone or leic I ngaeilge or OI. Lu was an important Irish pagan deity. Lug, his festival, was celebrated on 1st. August, the harvest festival of Lughnessa. There are also many place names named after him on the continent, Lugdunum, London etc. Suqe as I’ve stated was one of the names Saint Patrick had while serving as a slave to four masters. This is stated in the vitae of Saint Patrick in the translation from the Book of Lismore. This can be further analysed as Sui Qéad, the first seer (being a prophet or soothsayer). Old Irish comes from a Q celtic and P celtic mix. Hence Patrick was named Cathraige and Pathraig! The Q came before the P celtic! Celtic of course was not how these early people named themselves but is a 17th century linguistic term for the countries of Ireland, Britain, Wales, Scotland, northern France, Brittany and all speaking variations of Gaelic, goidelig, etc. Don often referred to in modern literature, as the dark one was, I believe, connected with Bran a pagan personage and hero Bran Donn. He was eventually christianised as Brendan and is associated with Bandon a place name in south west of Ireland. Macci were I believe the Magi (magicians, magistrates or healers) as in the 3 wise men 3 Magi or magistrates, who acknowledged Christianity and the birth of the saviour by bringing gifts. The magicians were the elite professionals. Ueh is just as it sounds uwey or Yahwey. Yahwey the Jewish title for God. This is the result of my reflexivity and interpretation of the letters on the stone. There have been many others throughout time. Embedded in stone, these words have been interpreted so many times by linguists, archaeologists, Irish medieval scholars and the interpretations tell us as much about the interpreters lives and era, beliefs and values as about the authors of the words themselves. My informed interpretation is based upon many years of reading Irish medieval texts and translations and in particular my study of Saints Lives and vitae written by ancient Irish authors and updated throughout history. My reading of this material naturally differs from those within a certain system of study and linguists would probably be horrified at my analysis based upon sound and informed reasoning. Yet reading the inscription the entire scene became a space of theatre and As Worton and Still state, ’the readers experience of some practice or theory unknown to the author may lead to a fresh interpretation’ and he labels the reader co-producers in inter-textual relations (Worton, and Still, 1991). Does ‘written in stone’ mean ‘forever as we say’ or as the original authors may have believed? Remembering all the time that the original stone and inscription was altered from having ogham characteristics to having a Latin and Christian format. Are the readings or interpretations of these words as important as the original texts? The interpretation by individuals brings their own narratives or histories to bear on the meaning and to the story that is passed on. So it may be written in stone but how we read this and the narrative we bring to that reading, tells our own story, our ideas, values, beliefs, and the prevailing creativity and power of religious and political institutions throughout time. A stone embodying values of early Gaelic people and their efforts to honour and preserve their heroes and ancestors, interpreted so many times by so many people, and spanning so many centuries still catches the attention of modern people. 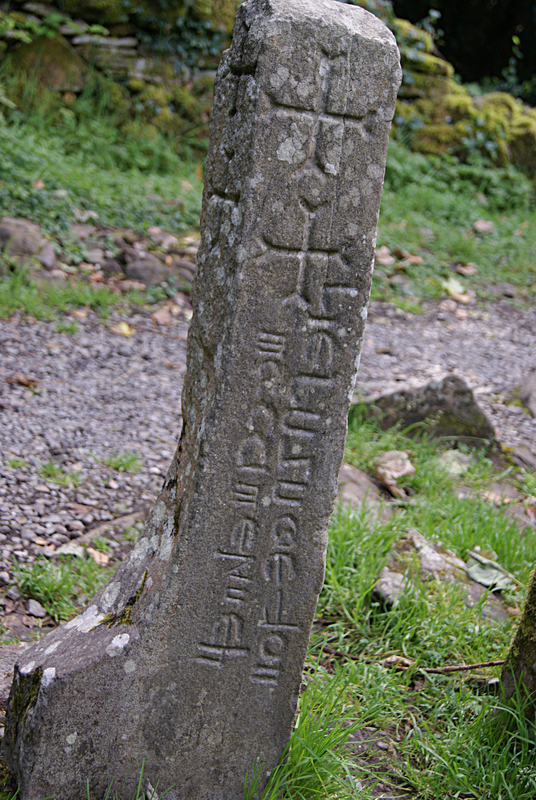 Despite the efforts of possible reformers of the 12th century in Ireland to airbrush pagan values and to promote a more central Christian authority, words and names of heroes, their statues and their genealogies inscribed on a stone in the middle of a little island on the Corrib lake, depicts the story of early Irish people as having many belief systems operating simultaneously and of the acceptance of many differing beliefs, and also as having multicultural layers and levels. So we see here the narrative a reader brings to a work of art often brings a ‘fresh interpretation’ as Worton and Still in 1991 stated. What is remembered and what is unsaid is the important issue here. 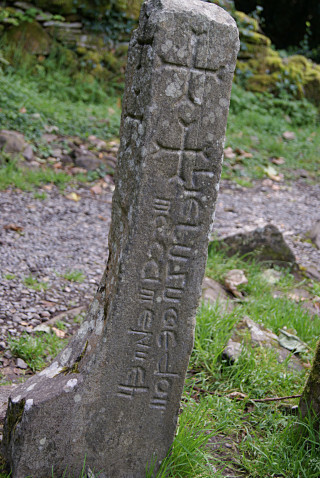 This stone has pagan or Ogham characteristics and it also has two crosses according to Etienne Rynne in 1995, and I quote, ‘the most common early reading was ‘LIE LUGDAEDON MAC LIMENUEH’… and such an analysis clearly indicates a link with paganism something which is further supported by the formula used for the inscription which is the same as found on most ogham-inscribed stones’ (Rynne, 1995). Was this the beginning of an Irish identity formulating the cornerstone of a sense of history? as Rebecca Blustein, would call it (2007). My own reflexivity a term used by Bernhardt House ((2007) incorporates the names of Pagan deities and Christian holy men and embodies my lived experience. In short these individuals were Lu, Suqe and Don were the magicians and servants or community of Yahwey . This inscription written about the 5th century (or earlier) in ancient Ireland embodies a complex, multicultural tapestry of personages, heroes, ancestors, holy people, their status plus an effort at defining an Irish identity. It also clearly gives definition to a transitional phase of the Christianisation of early Ireland. The authors were subversing Christian and earlier heroes so the reading could be decoded by those inside and outside of the new golden circle. At the end of our visit many meanings, many feelings about the inside and outside about recovered memories, the standing pagan stones outside, and inside of the church. The outside often deemed as wilderness, wild, uncivilised, by Christian standards and still almost ignored by visitors, the inside as sacred, holy, Christian, important and ordered. Nature and veneration of nature was central to the early Irish belief and value system. Bringing religion indoors in order to contain and constrain people gave a negative to the outdoors and to nature as important and sacred. Of course pilgrim sites and holy wells were Christianised as they were so embedded in the psyche and in the collective consciousness of early Irish people and it would have been detrimental to abandon them. People in a transitional phase of Christianisation would have those beliefs in their own value system. So confusion was the order of the day. In order for survival hidden messages and subversion was necessary for pre Christian ideas and beliefs. This island is known as the island of the foreigner Incha Gall and Patrick is the foreigner as history and centuries of story tells us but the island is also Incha goill and is also the island of the wood or forest coill is forest I ngaeilge and we know the Druids on the continent performed rites and religious ritual in the woods and the Oak was always venerated as a scared tree. So this little reilg or cemetery is located on an island where the ancients performed religious ceremonies and we see the names of Lug a pagan deity venerated in Ireland and on the continent and Christians adapted these pagan sacred sites and built churches as the sacredness could not be dismissed as the local population would have had collective beliefs related to these sites. We also see the players involved, the tribes and cultural diversity. This standing stone and site is a portal onto an ancient transitional phase of Irish history, a story within this inscription embodies layers of cultural ideas left unmentioned up to now, hidden by interpreters own agendas, the religious belief system that prevailed in Ireland for many decades. Up to recent times decoding and analysis was in the hands of the few and belonged to those with power and authority over ordinary folk! The wider folk tales and stories remembered are important in telling and decoding any ancient objects, inscriptions etc. Including the outside reilg and the standing stone as important and not just telling half the story is crucial. What emerges is a broader picture of life and society and renders more sensitivity to the ‘other’. We can then leave behind the exclusivity of thought in what is remembered. The role of place in remembering and preserving memory will then be less selective and more inclusive. We can explode the myths leading then to a fresh and more honest insight into what was previously left unsaid and develop a place or space for healing. It was with the study of ancient Irish texts and translations, annals, saints vitae, folklore, early Irish tales, poetry, Law texts, texts on illness and more, that I came to have a fascination with inscriptions and memory and with what is deemed as being reality and what is left unsaid or suppressed. Imposed memory is generally a story given by authoritative religious and politically powerful institutions in short those who had the money and facilities to pass on in print, their version of history. It cost a lot to turn a calfskin into a document for writing upon. So no words were used unnecessarily and story written down was done with much focus. Glosses added on later again and again were to reinvent or correct another authors ideas and to add new values or agendas. What is remembered today combines many levels and layers of creativity and fact, but it is what we decide to believe that is interesting. Just to continue to believe what was ordained throughout time by church and state as fact as written in stone and accepting their ideas as the only ones is the result of many decades and centuries of colonisation and control by the few over many. To look back and recognise the reasons for imposition of memory over populations and to see rather ambiguity and creativity is surely much more relevant in this era where thankfully technology brings choice to people on the margins instead of total control by central authorities. So the role of place and my accidental visit to this little island sparked my memory of reading about Early Ireland and the diversity that appeared to exist there. My upbringing in Ireland as a female born in the 1950s where religion was used as a force to contain and control people also influenced my desire to study how my ancestors really lived. This inscription or cryptic code, written about the 5th century in ancient Ireland embodies a complex, multicultural tapestry of personages and I might add clever cryptic messaging. In another decade or so will another individual interpret this stone and it’s meaning, I hope so! On a personal level, the magical element of that visit, the rainbow that appeared as we stood outside the little ancient church, the stones inside the door of the church, the bar around the stone like a belt reminding me of Cú Chulainn or Christ and the two stones on either side. Many meanings, many feelings, the stones outside, and inside of the church. The outside deemed often as wilderness, wild, uncivilised, dead and buried, the inside as sacred, holy, Christian and ordered. Yet the rainbow appearing upon a bush outside the church reminded me that we had indeed acknowledged the ancient ones whether Pagan, Christian or Jewish and the universe seemed to acknowledge that recognition! I think the American tourists almost expected a pot of gold to appear beside the rainbow, but we were indeed standing on treasured soil. There IS more in heaven and earth than we dream of in our limited philosophies! Having then returned on terra ferma we reintegrated back to structure and social order and had left Van Genneps’s state of liminality (Van Gennep1960) and Turner’s state of ‘communitas’ (Turner, 1964). The question is were we now transformed as individuals? Well perhaps for a short time! So perhaps in 2025 and later, interpreters will bring their narrative to this ancient monument and it’s words, names and story. I hope so! Fresh interpretations bring more meanings to the story. It is all relevant. If we can bring new insights and fresh ideas to bear we are being inclusive and recognising the relevance of all perceptions. The role of place and the landscape as a place for ritual and for remembering certainly comes to life in Inchagoill As a space for re evaluating and for collective healing this could be important in moving forward. Reform and inclusion of different ideas of thinking outside the box is an important step in not just updating analysis and study but in taking away the walls between insider and outsider, between old ways and new ways leading to connectivity of scientific disciplines and others. Fresh interpretations bring more meanings, more truth and justice to the story. If we can bring new insights and fresh ideas to bear we are being more holistic and inclusive and we are recognising the relevance of all perceptions. This inscription is a window onto early Ireland, its diversity and defines a changing society and clever cryptic messaging. Texts from an ancient site make us realise that we are no cleverer today than they were at sending texts and code messages and keeping alive important stories and remembering heroes. Just as an aside if you get the opportunity do visit this ancient sacred spot! Lug Suqe Don These are individuals and pre-Christian deities but also have specific attributes; Lug was called samildanch in Irish, meaning skilled in every art and craft and this would have included military skills. Lugh was also the name of the sun god and has been regarded by many interprets as an equal of the Roman Mercury, a war god. Lug was skilled in all arts and crafts and in stories. His arrival onto the Irish scene is told in a story by his arrival at Tara, the hall of the Kings of Ireland, and he challenged the leading skilled elite and outdid everyone of them present and was given top rank at the table of Tara. He was master of all skills simultaneously. Donn was the dark one as in the earth and would have represented fertility of the earth and farming. The earth was venerated as it was a highly important aspect of life for food etc. Su Qe as the sui Céad was first seer or enlightened one. This would have represented the spiritual element of the individual psyche. These three aspects of the individual, fertility, military skills and spiritual enlightenment were the three aspects of early Irish kingship. Macci or Magi as magicians would have had the skills of a seer or prophet, thus were the communal spiritual leaders. Men or manaig were the community of farmers who worked the land. These are the three aspects of kingship of early Ireland both on an individual and collective level and this triparte system were a vital part of the social system and embodied important aspects and beliefs and values of the Pre-Christian era. We can also see here the individual and the collective as important. House, Bernhardt, in Nageys, Myth in Celtic Literature’ Four Courts Press, 2007. Blustein, Rebecca, in Nagey, J, F, Myth in Celtic Literature, Four Courts Press, Dublin., 2007. Rynne, Etienne, The ‘LUGAEDON’ PILLAR-STONE’, Journal of Archaeological and Historical Society, Volume 47: 1995. Turner, Victor, The Ritual Process, Structure and Anti-structure, Cornell University Press, New York, 1964. Van Gennep, Arnold, Rites of Passage , Routledge Library Edition, 1960 reprinted in 2004. Worton Michael and Judith Still , Intertextuality : Theories and Practice, Manchester University Press, 1991. To finish a little poem or lyric I’ve written about reading medieval texts. And accounts of Irish ancestors and glories. Were the booty to build the steeple. While their ancestors lay on borders. Where Fénach put Féini through their paces. Laws of nature were forsaken. fascinating to its very core. Show the Mass principled by Pew. and Their Sense of Place. Inchagoill, island, stone, inscription, Lielusuqedonmaccimenueh,Ogham, tourist trail, deconstruct, re-evaluation, Outside, inside, reilg, lu, suqe, don, macci, men, ueh, beliefs, interpretation, collective, consciousness, embedded,other, control, ambiguity, creativity, inclusion, truth, justice, inclusive. 2000 Media Studies BCFE Dublin..
2003 BA NUI Maynooth subjects Anthropology, Irish Medieval Studies. 2004 NUI Maynooth MA Irish Medieval Studies.Celtic Deities. 2009 NUI Maynooth, MA Anthropology. Thesis topic was Saint’s Lives in the Book of Lismore. This page was added on 03/04/2014. Just as a post script!